In what may bolster its credentials as the global clean energy champion, India plans to develop small-scale solar power projects in the underdeveloped countries of Asia and Africa, according to two Indian government officials. Given its experience with rural electrification, India also plans to provide electricity access to villages in these countries. The Indian government has written to its ambassadors in Asian and African countries, asking them to identify proposals wherein India can participate to set up solar energy projects. The ambitious exercise to be carried out under the aegis of the newly formed International Solar Alliance (ISA) may be jointly executed by India’s ministries of external affairs and, new and renewable energy. “We intend to set up small solar projects in underdeveloped countries of Asia and Africa,” said an Indian government official requesting anonymity. 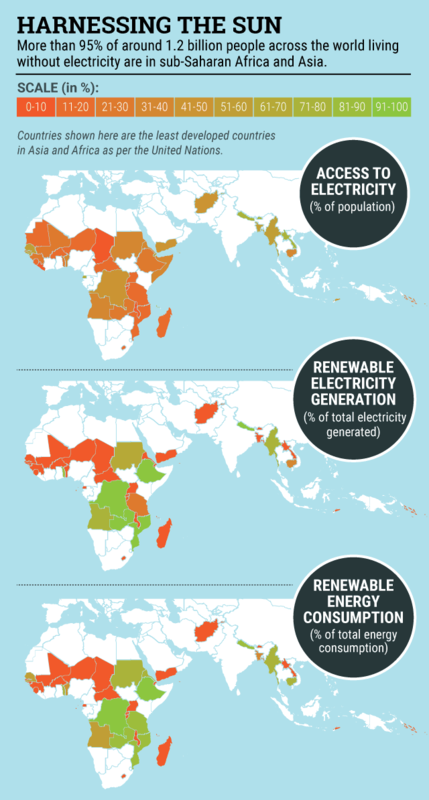 According to the International Energy Agency, nearly 1.2 billion people—which constitute 17% of the world’s total population—do not have access to electricity. 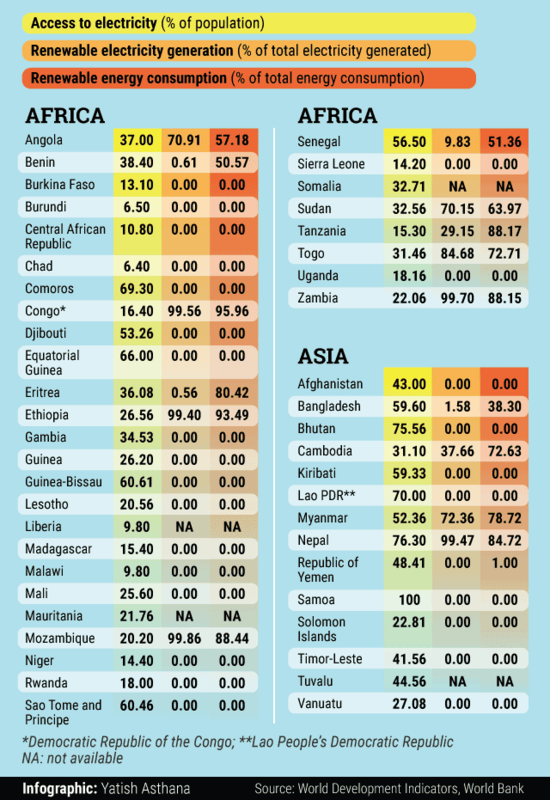 More than 95% of those living without electricity are in sub-Saharan Africa and Asia. India has taken the lead in championing the cause of solar power with ISA of 121 prospective member countries, including the US, France, Japan and China, to be headquartered in India. Prime Minister Narendra Modi, along with French President François Hollande, who was the chief guest at India’s 67th Republic Day, laid the foundation stone of ISA headquarters in Gurgaon, near New Delhi, last month. The alliance comprises of those countries which get nearly 300 days of sunshine in a year—located between the Tropic of Cancer and Tropic of Capricorn. Modi had shared the idea of ISA at the recently concluded United Nations Climate Change Conference in Paris to save the world from rising temperature. India has pledged to reduce emissions at the Conference of the Parties 21 and has been working on developing solutions such as battery storage technology for solar power. Queries emailed to the spokespersons of India’s ministries of external affairs, new and renewable energy, and Exim Bank on 1 February remained unanswered. By helping set up ISA, India has moved to the global centrestage and is now keen to play a leadership role on energy issues. India plans to develop the alliance as a global body, on the lines of others such as Organization of the Petroleum Exporting Countries. ISA aims to make clean power affordable and accessible by all, and mobilize a corpus of $1 trillion by 2030. “India has an unmatched experience in rural electrification. Successive governments have launched a massive challenge to electrify nearly 200,000 villages and habitations in India. Most of the electrification has been done through grid-connected power. However, in recent years, there has been a thrust on solar power electrification,” said Anil Razdan, India’s former power secretary. Given its role in an economy’s development, Modi has pledged to provide electricity to all Indians by 2022. The National Democratic Alliance government plans to spend Rs43,033 crore to supply electricity for rural domestic and agricultural consumption for 24 hours and eight hours, respectively. The exercise carried out through the Deendayal Upadhyaya Gram Jyoti Yojana focuses on separating electricity distribution feeders for domestic and agricultural connections. “In decentralized generation, this strategy (off-grid solar solution) is particularly helpful in underdeveloped countries which do not have a grid network. It helps leapfrog the need to establish a grid network before electrifying villages, particularly the remote ones,” added Razdan. The Modi government’s 100 gigawatt solar target, a five-fold revision from the previous goal and an increase of almost 20 times the current capacity, is part of efforts to provide power to around 280 million Indians who do not have access to electricity. “India will need to enlarge its solar photovoltaic or solar thermal manufacturing capacity to provide reliable, certified and economical equipment. India will also need to develop a funding platform for financing these energy projects,” said Razdan.